"Smart, important, and, as always, exquisitely written." --Daniel Gilbert, author of "Stumbling on Happiness "
Readers of Daniel J. Levitin's two previous "New York Times" bestsellers have come to know and trust his unique ability to translate cutting edge neuroscience into an informative and entertaining narrative. Now Levitin turns his attention to an issue that affects everyone in the digital age: organization. It's the reason that some people are more adept than others at managing today's hyper flow of data. "The Organized Mind" explains the science behind their success and--with chapters targeted specifically to business readers--shows how all of us can make small but crucial changes to regain mastery over our lives. "[An] impressively wide-ranging and thoughtful work..."The Organized Mind" is an organized book, but it also rewards dipping in at any point, for there are fascinating facts and examples throughout." - "The Wall Street Journal"
"From how not to lose your keys to how to decide when the risks of surgery are worth it, Levitin focuses on smart ways to process the constant flow of information the brain must deal with." - "The Washington Post"
"[M]ore than a self-help book...Levitin's insights into sleep, time, socializing and decision-making are profound." - "San Jose Mercury News"
"[An] ingenious combination of neuroscience and self-help." - "Kirkus"
"Dan Levitin has more insights per page than any other neuroscientist I know. 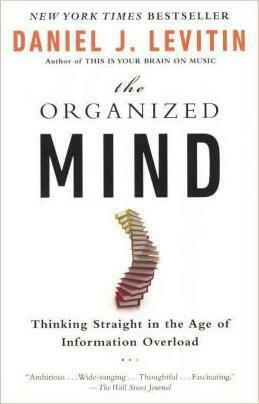 "The Organized Mind" is smart, important, and as always, exquisitely written." --Daniel Gilbert, Harvard University, author of "Stumbling on Happiness"
"A brilliant and engaging book about the science of thinking. "The Organized Mind" provides the tools that we all need to understand and manage the deluge of information that assaults us every day."" --"Jerome Groopman, MD and Pamela Hartzband, MD, Harvard Medical School, authors of "Your Medical Mind"
"Daniel Levitin's book follows in the ancient tradition of knowledge as a guide to a better life. Discover the creative power of organized thought, whether you are a writer or a scientist, a disorganized mess or a super robot seeking new frontiers of effectiveness." "--"Eric Kaplan, co-executive producer and writer, "The Big Bang Theory," writer, "The Simpsons" and "Flight of the Conchords"
""The Organized Mind" reads like a movie-- not the dry tome you might expect. It's an exciting tour through the science of productivity and how to best manage your thinking to get things done--and be more creative at the same time." -- David Allen, author of "Getting Things Done"
DANIEL J. LEVITIN is the James McGill Professor of Psychology and Behavioral Neuroscience at McGill University and is dean of the College of Arts and Humanities at the Minerva Schools at KGI. He splits his time between Montreal, Quebec, and the San Francisco Bay area.